LINCOLN, Neb. (KMTV) — Nebraska is one of a few states in the country that doesn't allow police to pull drivers over for texting and driving, or for not wearing a seat belt. Bills to change those laws haven't gone in years past. "We like to not force people to do things and it's the independence that we have here by Nebraskans and I respect that," says Sen. Robert Hilkemann. State senator Robert Hilkemann has proposed two bills. The first makes it a primary offense to text and drive. The second makes it a primary offense if any passenger in the vehicle isn't buckled up. Currently both offenses are secondary. That means you can only get pulled over if you're doing something else illegal too. "If we pass both of this legislation, during the course of this year, people will comply to the law and we will have fewer fatalities on our highways," says Hilkemann. If either bill is going to be debated among the 49 senators in the legislative chambers, they're going to have to get out of committee first, which in the past, hasn’t been easy. Let's start with seat belts. Transportation committee chairman Curt Friesen, told us last year, he's concerned about police profiling. Newly elected state senator Machaela Cavanaugh who represents west-central Omaha, acknowledges a seat belt requirement would make the roads safer but has similar concerns. "It's the penalization part of it that I would want to learn more about and hear from all the different audiences but I'm sold on the safety," says Cavanaugh. Cavanaugh says she wants more information in the committee hearing.. before she makes her decision. Senator Joni Albrecht says she also wait to pass judgment. But expressed a lot of concerns. "If we can once again have our children go to school on the school bus without wearing seat belts, but we're going to dag-gum be sure that everybody driving a car is all strapped in..I've got to keep an open mind,” says Albrecht. “I'd probably lean towards the texting than I would everybody in seat belts." 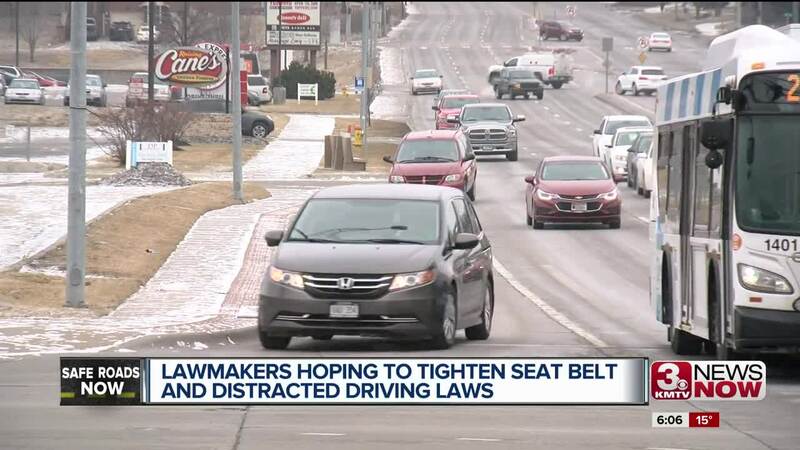 The distracted driving bill would make it a primary offense if the driver of the vehicle is seen by police texting or using apps like Facebook. Drivers would still be allowed to make phone calls and use their phone for GPS. Nebraska is just one of seven states in the US that doesn't do this already. Hilkemann says his constituents in west Omaha have been vocal to him about on texting and driving. "We going to catch everybody that texts? Obviously not, but we don't catch everybody that speeds either,” says Hilkemann. Albrecht says if she hears similar concerns from police, she'll likely vote for the legislation to move on to the floor. "I'm talking from the Nebraska state patrol to the counties to the cities, if they truly were on a push that it needed to happen because they've seen enough, that could sway my decision,” says Albrecht. Hilkemann hopes the new batch of senators changes the dynamic in the transportation committee and the legislature as a whole. "Some year it will happen. And I hope it's this year,” says Hilkemann.